I have always loved giving edible gifts as that is how I show my affection for people. I tend to make something with a lot of love and hope that shows in the gifts that I give. These are so simple and quick to make with only a few ingredients you can whip them up at the last minute to take as a hostess gift, as a present or even for an after-dinner treat. Make these for yourself or someone you love. Just do yourself a favour and find an excuse to make these soon! Place cacao powder, coconut oil and honey into mixing bowl, melt for 2 minutes / 70°C / Speed 2. Meanwhile, divide the cranberries and almonds evenly between 12 of the molds. Once mixture is melted and combined, pour approximately half on top of cranberries and almonds to fill each mold. Use spatula to press mixture in if necessary and smooth top. With the remaining half, add peppermint oil to mixing bowl and mix for 5 seconds / Speed 2. Divide the mixture evenly between remaining 12 molds. Place the molds onto a tray and tap the tray gently on the bench several times to ensure that any air bubbles are forced out. 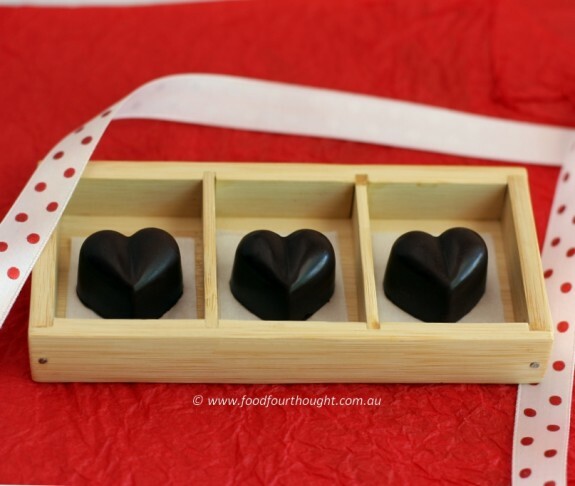 Smooth any chocolate that may have been disrupted and place tray into fridge for approximately 1 hour or until firm. Remove from fridge, pop out of molds and gift wrap or eat. 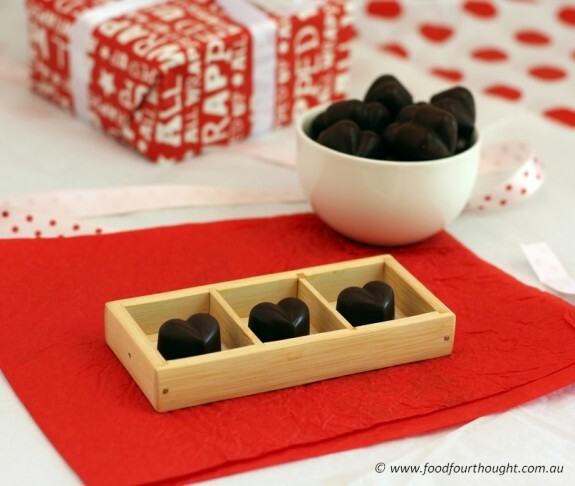 Store remaining chocolates in an air tight container in fridge until ready to use. * Flavour these with whatever you like. Orange essential oil would be lovely also. * You can double, triple, even quadruple this recipe to make a large batch. If you don’t have molds, just line a baking tray or tin and pour the mixture into that then top it with what whatever you like. * If you want to chill them quickly you can put them into the freezer for 15 – 30 minutes or until firm. * If you’d like to know more about the pure essential oils I use, please take a look here. ease: 9.5/10. Could it be any easier?! taste: 10/10 I know this isn’t “real” chocolate, BUT it is better for you, super easy to make and delicious. I hope you make it for yourself. would I make it again: Yes!!!!! As much as possible.